It was 1988, and I was in my seventh grade year. There were two singles by completely different acts (from different musical genres) with the exact same title, Wild Wild West. The first was by rapper Kool Moe Dee (which, unfortunately, I was unable to find a decent version to copy over). The other one was by a UK group, The Escape Club. Me: Can you play Wild Wild West? DJ: I just played it. Me: Not that one, the other one… by Kool Moe Dee. A decade or so later, when the movie Wild Wild West came out (starring Wil Smith & Kevin Kline), Smith recorded a track for the soundtrack which included a sample of the Kool Moe Dee version. Here’s the Escape Club version, although I recommend tracking down How Ya Like Me Now and giving it a listen. Five years ago today – a Wednesday even – I first met the woman who would become my (second) wife. It wasn’t an overtly planned thing – we had met online and decided to meet in person at a local Mexican restaurant for chips and tea. I had only been a widower for a very short time and was just looking for people to hang out with – to get me out of my head and help to keep me from slinking into whatever dark places 30-year old widowers might find themselves in. We talked for close to two hours, and made plans to get together over the weekend for dinner. But she agreed to try dinner again the next week. MCC: Do you know Jeff Evans? Neigbors: Oh, yeah, great guy. Why? Neighbors: When you go out again, can we go with you? We haven’t seen him in a while and want to catch up. MCC: Um, okay, sure. How about dinner, [day, time and place]? And that was it. MC and I started hanging out together regularly, going from a few times a week to daily over the summer, and have been together ever since. I think the longest we’ve actually been apart in that time has been about a week. Sound sappy? Probably, but she is one of the best things that has happened to me, and I’m truly grateful every day that we found each other – especially since our paths probably crossed several, several times during our years in college without meeting. 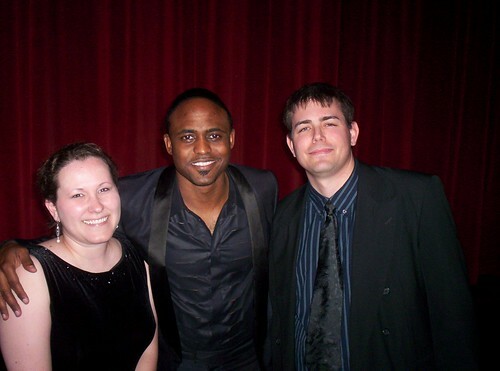 Even Wayne Brady gave me props. The beginning of the end for DRM? Tor/Forge announced today that they will begin selling their ebooks without DRM – their entire list should be DRM-free by early July. Scalzi has already posted some initial thoughts here. Charles Stross, having posted some thoughts about Amazon’s ebook strategy, offers up his thoughts as well on what the Tor/Forge move means. My initial thoughts (not having read Charlie’s post yet) – the removal of DRM makes me happy, and I’m curious how long before others may jump on the bandwagon. Personally, I’ve gotten a few books through Amazon (but have generally avoided them, on principle), and only two books through Apple (avoiding the DRM), I have gotten most of my books through Barnes & Noble. As a consumer, I may be more inclined to get more books through Apple/iBooks if the DRM goes away. The catch there – I wonder if Apple would enact their “unlock fee” (like they have for “upgrading” any old audio purchases) on previously purchased books to remove the DRM, or if it would just be a matter of downloading a new copy? To be more specific, “Classic” literature, as it’s taught in most classrooms. That’s not to say I am against ye olde staples of cannonicaly approved “great works,” as a writer that borders on heresy. No. Read them for the story. Read them for entertainment. Read them becuase you’ve finally gotten around to wanting to read the full text instead of the watered-down-for-movies versions that have been produced. Just don’t read them to learn, not if you want to write anything. Wait, that’s not 100% right. You can still learn a lot from them – story, some character work, tone and voice if you are expressly trying to write something in that style. You just need a big fat salt-lick if you want to write something more contemporary. Understand that language changes over time, both mannerisms and contect meanings. One hundred years ago, calling someone “gay” meant something completely different than it does now. This change is also quite evident when reading dialogue. That’s part of the reason I’ve stalled in the reading of the Sherlock Holmes collection, Ive just gotten tired of all of the ejaculations. I’ve lost track of how many times either Watson or Holmes ejaculate something as a means of delivering dialogue. “That’s amazing,” he ejaculated. Twenty years ago these were the kinds of techniques present in almost every work, those “classics,” we were reading for school. That’s part of the style I picked up and made dialogue in my early stories get all wonky, and at the time I was reading “contemporary stuff” for pleasure, not as an exercise in considering technique, so I was late to the catching the current-trend-style-train. Don’t let that happen to you. If you want to write, look to contemporary works for current style trends in delivering dialogue. Back in 1995, a little Texas band by the name of Deep Blue Something hit the charts with Breakfast at Tiffany’s. It was from their big label debut, Home (which was actually their second album), and was the chief single of their career. Yes, I said career. Which is sort of sad, because I think the album stands up quite well, and easily makes my shortlist of albums that can be repeatedly listened through in it’s entirety. I strongly recommend picking it up, or at least finding it for a listen, but here’s Breakfast at Tiffany’s for this week’s MVM entry. After dropping the idea in an abstract fashion into the last post, let me provide some context for those reading and not used to idea as it applies to writing. For years, dating back to my earliest fiction writing classes “show don’t tell” was a phrase thrown about during the workshops but was usually defined vaguely at best. It often went something like, “This part here is okay, but it might work better if you show more than you tell.” As a novice, I heard the basic idea behind the phrase but understood it more as “add more adjectives” and failed to really understand it at an intuitive level until much later. It took me attending a writer’s workshop (again with the Uncle Orson reference) to really get a clearer understanding of why this is a sticking point concept for newer writers. Physically being present while someone is relaying a story is a passive relationship – you have that opportunity to ask questions or to connect with the emotional delivery of the speaker. Watching a well-acted play or movie can deliver much the same response because you have the opportunity to pick up on subtlties of character or context of location. Reading fiction, however, is a much more active experience insofar as if it’s not written down the reader doesn’t have the chance to experience it. It’s the power of the reader’s connection with the story experience that determines how well the narrative ultimately works. Look at it another way, think back to your days as a kid. How many times were you told by someone – a parent, teacher, older sibling – not to do something. They could even tell you why you shouldn’t do something – touch an active burner on the stove is a classic example, becuase it will hurt – but until you actually did it, experienced the moment of searing pain as the soft pink flesh of your finger touched the spiraled metal coil, do you actually understand what they were telling you. Showing is the act of presenting the story, stretching the moments out and providing necessary details so the reader comes away having lived the experience of the story without having the scars from the stove top. Classic example: Telling: John was angry. Showing: John’ paced the floor, his arms shaking as he repeatedly clenched and opened his fists. Yes, showing may involve adjectives, but ones very specific to the intended vibe and tome of the storyones, not lines of bloated purple-prose intended to add layer upon layer of paint on the canvas so the image eventually gets lost. It’s painting with subtlties instead of definites. It’s giving the readers the chance to experience the world for themselves. It’s breathing life into the otherwise inanimate. I have been thinking a lot about Outlining recently… (yes, I’m cheating with today’s title since I am already anticipating talking more about it in the future) and I think part of it started with this post… One of the sites I frequently check out is Magical Words, and it’s a great location for conversation and perspective, especially for those in the process of breaking into the game. For the sake of catching up those not used to the writing game, here’s some brief background info. In the writing world there are two extreme camps of technique: “Plotters” and “Pantsers.” Just in case the distinction isn’t clear by labels alone, here’s a distinction. For “Pantsers” think “Seat of their Pants” as their approach to work. The Improv type in theatre, just making it us as they go. “Plotters” are the other end, working things out in advance and knowing how the core of the story will work before they start logging the text. Plotters are usually identified by their outlines and (potentially) copius amounts of notes generated in the development stage of a project – think Tolkein and the reams of posthumous publications from his Middle Earth world building notes. Despite identifying more, at least conceptually, with one extreme or the other most writers (my opinion) fall somewhere in the middle. At least, once they’ve been at it for a while. When I started, I was more of a pantser and could manage that approach for a short story, but not so much when I tried anything longer than a few thousand words. I attempted to blend the two, starting a project by pantsing then providing carrots to lead my efforts for the next writing session, then adding more carrots at the end of future sessions. Using that approach, I found that I could extend my reach by several thousand words, but it was still, at heart, a pantsing approach. It’s taken a lot of reflection and self-evaluation to realize that my way hasn’t worked – I may be able to get away with the “carrot” approach in the future, or for smallish/novella length pieces. The fundamental reason for faiure to work, though, stems from not knowing the story well enough to know where I am trying to write to. Something that plotting should help with, and often involves summoning that oft dreaded, evil beast. My 9th-grade self cringes at the thought of an outline and the rigid form that was practically beaten into us during the “This-is-how-you-write-a-researh-paper-and-the-only-way-I-will-accept-it” portion of the class, so much so that it stunted my thought process on what it meant to “outline” a creative project. I outlined a fantasy trilogy (as envisioned, but it could just be a long book in three parts) using the Roman numeral and subheading approach, then shelved it because I thought I killed the motivation behind it (read: I pantsed the outline which told me the basic story, but I didn’t actually show said story). The revelation I’ve had in the last year is to take “Formal Outline” idea and toss it, and think in terms of a Synopsis approach – something that tells the story events. Sketch out a watercooler conversation version of the story, the kind of thing you might hear when telling someone about a movie or tv episode – “Dude goes here, this happens. Becuase of that, he decides to do this.” Hit the highlights, maybe with a shade of details, but without too much emphasis on the finer details of dialogue, mood, character depth and the like. Thinking of an outline in this sense feels more natural since it involves ultimately ironing out the basic beats of the story, allowing the act of writing to become an exercise in guided pantsing. Short version: Figure out what the story is and how you want to tell it, then endeavor to show the story. For the record, I do still have the fantsy outline, and now that I’ve had this epiphany I am planning on ressurecting it as a project to see if my ideas from twelve years ago are still viable or if it would need serious revision work.